Are Wireless Sensors Suitable to Heritage Buildings? Wireless sensors can be used with fair advantages in historical buildings. They do not need the works that normally have to be carried out with traditional appliances. In order to understand if this kind of sensor fits with the performances of reliability and effectiveness, Prof Mecocci (Siena University) and Mr Barneschi (Italian National Fire Corps) have studied the problem in order to gather data to develop specific guidelines and installation procedures capable of granting the proper performance and security level. One of the sub-goals of the study was to gather real data from real operative condition to guide us toward the above main objective. As specialists know, one of the main problems in applying fire safety engineering to cultural heritage is the lack of data about the behavior of artifacts and materials used in historic buildings to fire. Such problem concerns also the effect of extinguishing agents to the same materials. U.S Department of the Interior – Bureau of Land Department, has published on its website (http://www.blm.gov) a page dedicated to the behavior of historic materials to fire. The study (Bare Bones Guide to Fire Effects on Cultural Resources For Cultural Resource Specialists), by Ms Kate Winthrop, synthesizes some of the technical information available on the effects of fire on cultural resources. In particular, much of the data published is from drafts of articles for a publication to be released under the USFS Rocky Mountain Research Station “Rainbow” series. The problem of restoration-rehabilitation sites fires and their consequent severe damages to the historic-artistic heritage seems to not receive the due attention yet. There is probably a lack of adequate information, which would allow such heavy risk emerge and enable to establish the necessary landmark upon which the consequent initiatives could be organized. The contribution of Mr Stefano Zanut (Italian Firefighters Corps), which is a part of a research carried out by Venice University Institute of Architecture (I.U.A.V. – Istituto Universitario di Arhitettura di Venezia), aims to begin filling up that gap through the data analysis provided by the Firefighters Corps operating in Venice, where, because of building fabric typology existing there, every of its building sites can be identified as “restoration site” of an heritage building. Did Rome’s Colosseum suffered a post earthquake fire in 271 A.D.? In 217 A.D. Rome’s Colosseum was slightly damaged by a fire. Since Rome is built in a seismic area and there is an earthquake reported during September 217 A.D. ,Rome Univerity La Sapienza’s Professor Enzo Cartapati has studied the possibility of a fire event due to the seismic event. Together with Maurizio Cerone, Prof. Cartapati has conducted a structural analysis of Colosseum’s stone columns, in order to understand if actually the fire occurred after the seismic shock. On April 10-11th 2003 the Conference “Integrating Historic Preservation with Security, Fire Protection, Life safety and Building Management Systems” has been held in Italy, in Rome. The Conference has been hosted by the Italian Fire Corps (CNVVF) structure which studies for fire safety of the built heritage, together with the NFPA 909 and 914 Committees. The main topics of the Conference have faced the problems which arise with the management of safety conditions in cultural and heritage buildings. The US Department of Housing and Urban Development – Office of Policy Development and research (http://www.huduser.org) has issued in 2007 the second edition of the Guidelines on Fire Rating of Archaic Materials, produced by the National Institute of Building Sciences. Older buildings often contain materials that are fire safe but not listed in current fire ratings sources. This lack of documentation hinders the modernization and reuse of our nation’s building stock. The Guideline on Fire Ratings of Archaic Materials and Assemblies is a compilation of fire ratings from earlier sources for a wide vari ety of materials and assemblies found in buildings from the nineteenth to the mid-twentieth centuries. This guideline also provides methods for calculating the fire resistance of general classes of archaic materials and assemblies for which no documentation can be found. First published in 1980, this guideline has found widespread use and acceptance among architects, engineers, preservationists, and code officials. It has been incorporated into numerous state and local building codes, three model code publications, and two NFPA standards. Now, for the Partnership for Advancing Technology in Housing (PATH) program, the Guideline on Fire Ratings of Archaic Materials and Assemblieshas been updated to reflect changes in assessment techniques and to provide additional information on doors. HUD is pleased to reissue this important and time-tested publication, knowing that it will remain a valuable resource for preserving and reusing our nation’s housing and building stock. 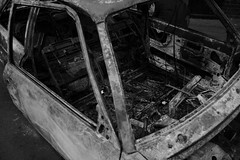 Denghbig’s (North Wales, UK) Cae Dai cars museum has suffered extensive damages after a fire broke out on December 1st, 2009, night in a suspected arson that has damaged a collection of tens of vehicles. Fire engines attended the fire at the Cae Dai museum after receiving a call at 11.07 pm on Tuesday. A man that was staying at a caravan on the museum site, was taken to hospital by ambulance as a precautionary measure to be treated for possible smoke inhalation. A caravan situated near the building was also completely destroyed. Firefighters used two main jets and two sets of breathing apparatus to tackle the fire. An investigation is now being conducted by Police into the cause of the incident, but it is too early to confirm if it was arson. At approximately 8:00 a.m. on Saturday, October 29, 2005, The Reluctant Panther Inn & Restaurant, a landmark in Manchester, Vermont (USA) for decades, was devastated by a fire that destroyed the main inn building, the restaurant, and the tavern. This building was a 3 story 1850’s vintage wood-framed, balloon construction building. The staff was tending to their morning chores when they went to the basement to investigate an odor of smoke. Upon entering the basement laundry area, the owner witnessed a fire within the barrel of the commercial dryer. He immediately activated the building fire alarm using a manual pull station and called 9-1-1. The building contained only 2 guests at the time of the incident and their evacuation was facilitated by the fire alarm and hotel staff. In analysing fire risks posed to historic buildings, the use of statistical data and lessons learned for managerial needs may be considered an important tool. Why do we need these tools and what is the knowledge provided and what is the problem with it? In analysing the trends of fire risks we have to consider, that most of the listed objects are in use (housing, residential, etc.). Statistical comparison will be more likely related to existing statistics on residential buildings. Every building management needs clear indication about the priorities of building upgrading. As the existing data bank systems are national reports from several European countries there is no possibility comparing the categories used. On November 5th, 2009, a building in the historical center in Naples (Italy) has been damaged by a fire occurred in a flat in the early afternoon hours (around 2.00 p.m.). The building has a residential use and the fire seems to have been ignited by a faulty electrical appliance in the bedroom of an apartment at the third floor. The occupants of the apartments escaped, as the fire grew very fastly and made it impossible to extinguish it. Also other residents could escape immediately, while a woman and her five children who lived in the building have been saved by firefighters. On April 5th, 2008, Italy’s Castello di Moncalieri (near Turin), a royal residence on World Heritage List, has been seriously damaged by a fire occurred under the wooden roof. The fire has been seen around 5 a.m. by a bypasser, on saturday morning. Firefighters have been working with 30 teams and needed several hours to extinguish the fire. It is possible that the fire has been caused by renovation works which interested also the wooden structures of the roof. Three important rooms of the historical castle (built in 1100) located in the tower where fire probably started have been completely destroyed. The massive bed of the King of Piemonte has been severely damaged by the fall of the stories of the tower. Damages sum up to 10.000.000 euros. On 21 January 2009 the Royal Palaces of Abomey (Benin) have damaged by a fire which destroyed some buildings. In particular, the fire seems to have been caused by a brushfire. The flames have consumed the straw roof and the framework of six buildings (which enclosed two temples to Agasu, the tombs of King Agonglo, King Ghezo, and each king’s 41 wives). The fire run fastly due to the strong winds. Even if the alarm has been raised and the arrival of help has been immediate, when the rescuers arrived the buildings were engulfed in flames. The restoration will include drying the water damage and the installation of fire hydrants. been made in this publication written by Geir Jensen, COWI AS, Norway. Results are evaluated and recommendations given. A fire protection system useful for the purposes of cultural heritage buildings based on the use of oxygen depleted atmospheres is the Hypoxic Air. This system has been presented during the Cost C17 Action meetings. In particular, in the downloadable document “Inert_Air_Presentation_for_COST_C17_Ljubljana_May_2006” (presented during the joint NFPA – Cost C17 action meeting, held in Ljubljana on May 2006), it is possible to find some of the more important information about this system. The presentation has been made by Geir Jensen (COWI AS, Norway) and Jan Holmberg Department (Building Sciences, Royal Institute of Technology, Sweden). Other: Firefighters evacuated paintings and other artifacts. Passer-by (or workers) reported the fire, probably no sprinkler or fire detection system active at the moment of the fire. On October 27th, 1991, the historical theater “Petruzzelli” in Bari (Italy) has been destroyed by an arson that left only the masonry shell. The original theater was opened on February 1903, with 404 seats. On October 5th, 2009, the theater reopened. The total costs of reconstruction works after the fire, that occurred during refurbishment works, are around 50 million euros. Cost Action C17 – Fire loss to historic buildings – has been an important activity on fire safety of historical and cultural buildings developed with EU funds that ended its activity in 2006. The intention of the Action was to address the significant physical and cultural loss of Europe’s built heritage to the damaging effects of fire.